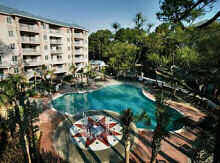 Hilton Head rentals are superb! Renting a private home, villa, or condo is another option that families might consider. 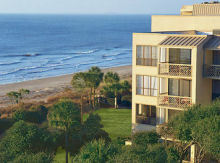 Destinations like Sea Pines Resort, Palmetto Dunes and Marriott Vacation Club await you. Want to be close to the beach, or beachfront, or maybe a view of the fairway is more your style, whatever it may be, it's your choice! These perfect accommodations will make for a very memorable family vacation, they have for me and my family. This is one of my favorite Hilton Head rentals. Barony Beach Club is tucked along the beach in Port Royal Plantation. Spectacular beach and pools with a full service spa. Near Port Royal Plantation Racquet Club where legendary matches are played. Golf nearby. Two bedrooms, two bathroom units are within walking distance to the beach. We have stayed here and really did not mind the units that were a walk to the beach, it was pleasant (they do have golf cart transportation if you dont feel like walking), many units overlook a big pool. 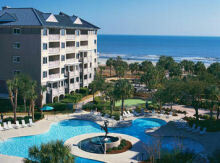 Read more about Hilton Head Island Vacation Rentals at Marriott Barony Beach Club. 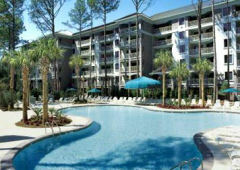 Disney Resort is one of the best family oriented Hilton Head rentals. It's located on 15 acre islet in Broad Creek. Many villa units have marsh or marina views with porches and rocking chairs. The resort has a fishing pier and beach club a mile from the property with shuttle service provided. Kids are kept busy with many summer-camp-styles activities. The fishing pier was a big hit with my teenagers (it got them out of bed, no sleeping in when there's crab to catch). We met one father /son team who caught enough crab to eat for breakfast lunch and dinner. You can rent the poles and crab nets at the dock. Some units are 2 bedroom and 2 bath. 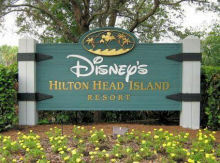 Read more about Disney Hilton Head Island Rentals. 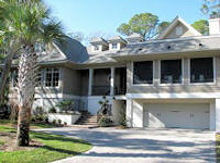 These two Hilton Head rental properties are located in Sea Pines Resort and within the heart of Harbour Town. 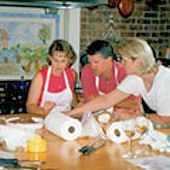 Both resorts are an excellent choice for Hilton Head vacation rentals if you enjoy sightseeing, championship golf, biking, waterfront dinning or shopping and water activities. Since Heritage and Harbour Club are located in Sea Pines Resort you are able to enjoy the bike or jogging paths and the canopy of trees with moss dangling from them that provide an excellent source of shade. The beach is a fifteen minute bike ride away, very enjoyable. Try the Harbour Town Bakery next door, delicious muffins, cookies and sandwiches. Hilton Head rentals can't get any better than the Grande Ocean which resides on 17 oceanfront acres of South Forest Beach. This Hilton Head vacation rental has two bedroom villas, four outdoor pools, one indoor pool, tennis courts and health club all situated in lush tropical gardens with white sandy beaches. We enjoy this resort because of the enormous size and it gives our teenagers many options for activities (they dont get bored). Also, theyre not too close to mom and dad if you know what I mean. The beach is excellent! Located on six acres of oceanfront property, adjacent to Sea Pines Resort Beach Club, two bedroom villas and spectacular scenery makes this a relaxing choice for a Hilton Head vacation rental. With golf (The Ocean Course is a quarter mile from the villas), tennis, and a new state-of-the-art fitness center you will not be bored. If you are looking for a smaller property thats quiet, cozy and close to the beach with an excellent location, this is the place to stay. Monarch at Sea Pines Hilton Head rentals are older but nice. The SurfWatch is a family-oriented two or three bedroom villa complex. 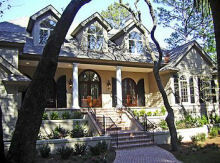 This Hilton Head vacation rental captures the setting of the Low Country and is our favorite among Hilton Head rentals. The property is massive and has a boardwalk to the beach, nature paths, playground, fire pit, oyster-shucking tables, and a beach front pool with bar. Because this property is so large, golf carts shuttle you to and from the beach. The SurfWatch is one of the newer Hilton Head Vacation rentals; it feels like a home away from home but with the beach close by. We stay here often because we can rent a three bedroom and the bedrooms are a good size. The Palmetto Dunes is a Hilton Head vacation rental complex offering beautiful private homes, villas with oceanfront, fairway or lagoon views and miles of scenic bike paths. In addition to all the area offers it has three signature golf courses, Rod Laver Tennis Center and a good stretch of the beach. If that's not enough, this resort neighborhood is centrally located. Shelter Cove Marina is close by. Kayaking, nature excursions, deep sea fishing charters, dinner cruises, sail and power boat rentals all may be enjoyed at this marina. The oldest and best know of Hilton Head rental developments, Sea Pines Resort occupies 4,500 thickly wooded acres (absolutely beautiful) with three golf courses, tennis clubs, stables, a nice beach, shopping and miles of bike paths. 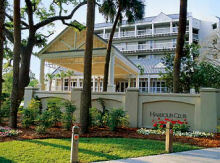 Located on the southernmost tip of Hilton Head Island, most stay at least a week. This area attracts golfers because Sea Pines is the home to the Verizon Heritage golf tournament, a major stop for the PGA tour. One to four bedroom villas and private homes available.